I decided to keep a mini journal with updates about having a standing desk, I figure a lot of people are thinking about it (like I was) and it might be handy to have this information. Today is the first day I am using as standing desk as described in this article . It’s been exciting “building” this. Today is officially the first full day and I am finding that having the shelf really helps, also I’m feeling less tension in by upper back than usual. I got this square cushion as well for standing on it (no shoes), and I think it’s more comfortable, compared to standing with runners. I noticed I tend to shift on my feet at lot, probably that’s good for circulation. I was slightly dreading the idea of coming to work and standing, but when I got here I forgot about it, I was thinking that a new setup like this would take a little while to get used to. I’m at half day and feeling the legs a bit but not much. I had to show some code to other people here and it was strange to share the space but it actually was nicer to be standing, it seemed more conducive to a conversation about the code. I slept like a baby ( I’ also cycling 16 miles a day commuting, I assume that is a contributing factor, however the big change is the standing) I am noticing I am generally in a better mood though. Started the day with a lot of energy (and an 8 mile cycle) I m after the first half and feeling good. I m noticing my upper-back is really way less tense than normal (ie never noticed how tense I was) also feeling a bit of pain in my lower back, I guess it’s muscle building for standing for longer because it goes away. I had a breakthrough, I think. I am not only able to stand for longer but also I feel higher levels of energy. I would still really like to be able to sit down (particularly when I need to work late,. I also think this is helping my core muscles, but there is no way to measure that so… i.e. be able to revert to normal desk) however I think this experiment is pretty successful. Oh and yes, when people see it they ll ask you about it, so if you are thinking of doing this the first few days everyone asks you about this. 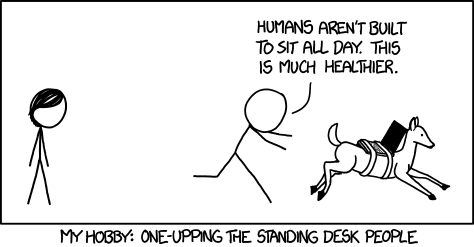 So basically if I had a standing desk where I can also sit if I want to, that would be amazing =).